DIET – THE most IMPORTANT PREVENTATIVE MEDICINE! Rabbit’s teeth grow continuously throughout life. They depend on their diet to help wear down their teeth. Without healthy teeth, a rabbit won’t lead a healthy and happy life. Timothy, Oaten, Wheaten, Pasture, Paddock, Meadow or Ryegrass hays. NB: Lucerne or Clover hays are not recommended as they cause obesity. Hay wears down teeth; reduces boredom and behavioural problems; aids digestion. Ensure hay is not dusty or mouldy. Good hay smells sweet. Store hay where air can circulate – not in plastic bags. Veges: broccoli, snow peas, cabbage, beet/carrot tops, spinach, brussel sprouts, celery, bok choy, other Asian greens, dark leafed lettuce varieties (NOT ICEBERG LETTUCE! ), kale etc. Herbs: parsley, endive, coriander, dandelion, mint, dill, basil, water cress, mustard greens, edible flowers from the garden (organically grown and not from the florist), chickory etc. Ensure all food is washed to remove chemicals / pesticides. TREATS: 1 -2 tablespoons per rabbit per day ONLY! Fresh fruit: apple, apricot, banana, berries, carrots!, capsicum, cherries, cranberries, mango, melons, peach, plum, papaya, pineapple. Pellets: too much of a good thing? YES! Rabbits should NOT BE FED SOLEY on “pellets” or “mixes”. They don’t meet nutritional standards and reduce the bunnies desire to ingest hay. Avocado, beans, biscuits, breads, breakfast cereals, cake, chocolate, cereals, caffeine, corn / popcorn, dried beans, dried corn, grains, meat /fish, nuts, oats, peas, potatoes, rhubarb, sugar, seeds, sweets, wheat. Mineral or salt blocks are required. Fresh water must be available at all times. Offer TWO (2) water containers in case one is spilt. All bunnies need exercise outside their hutch every day, approximately 4 hours. Sunshine: indoor rabbits may lack vitamin D, thus a complete and balanced diet is essential. 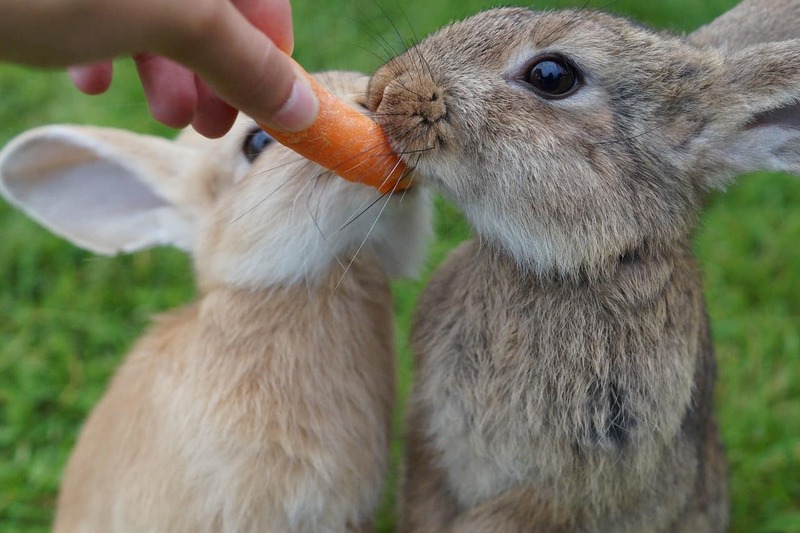 Bunnies are natural chewers, so provide lots of chew toys – wooden blocks, old telephone books etc. Searching for the best Rabbit Vet in Sydney? Book online or call us today for an appointment or click to read more about rabbit health.